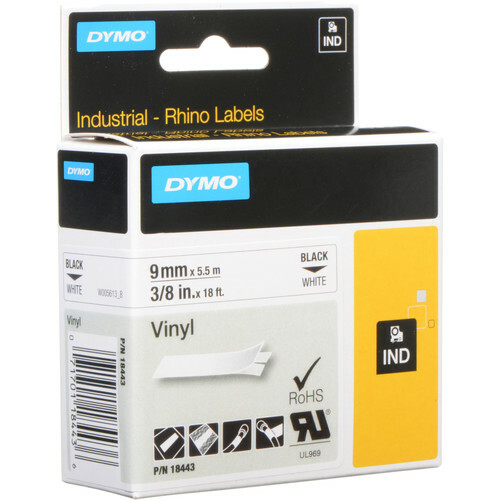 Box Dimensions (LxWxH) 4.35 x 3.4 x 1.2"
Rhino 3/8" White Vinyl Labels (Black Print) is rated 4.5 out of 5 by 2. Rated 4 out of 5 by CTNYRFAN from How do you stop a charging Rhino We order these labels in quantities, from 5 to 15 at a time, several times a year. The previous supplier we were using always had problems filling the order. I saw that B&H now carries this product and was more than happy to give them a try. Like every other order with B&H it was good cost/value and the ordering , payment and shipping process met or exceeded my expectations. Rated 5 out of 5 by Lu Lu from I never won't to be without My company uses these Labels for wiring jobs. They are the best labels money can buy ! Would never won't to be on a job and not have these labels..